1.Place the nuts, oats, Chaga powder, cacao powder and desiccated coconut into a food processor and blitz on a high speed for 30 seconds. 2.Add the remaining ingredients except the hazelnuts, blitz on a high speed until the mixture begins to clump together and starts to form a ball. Place the mixture into a large bowl, add the hazelnuts and mix the nuts into the mixture with your hands. 3.Roll the biscuit “dough” out into a 1,5cm thickness or press the mixture into a baking tin. Cut out the biscuits using a circular cookie cutter or clean glass bottle. Reshaped the remaining “dough” and continue this until all the “dough” has been used. Then place into the fridge for 15 minutes to firm up. 4.While the biscuits harden in the fridge, slowly melt the chocolate in bain-marie then set aside. 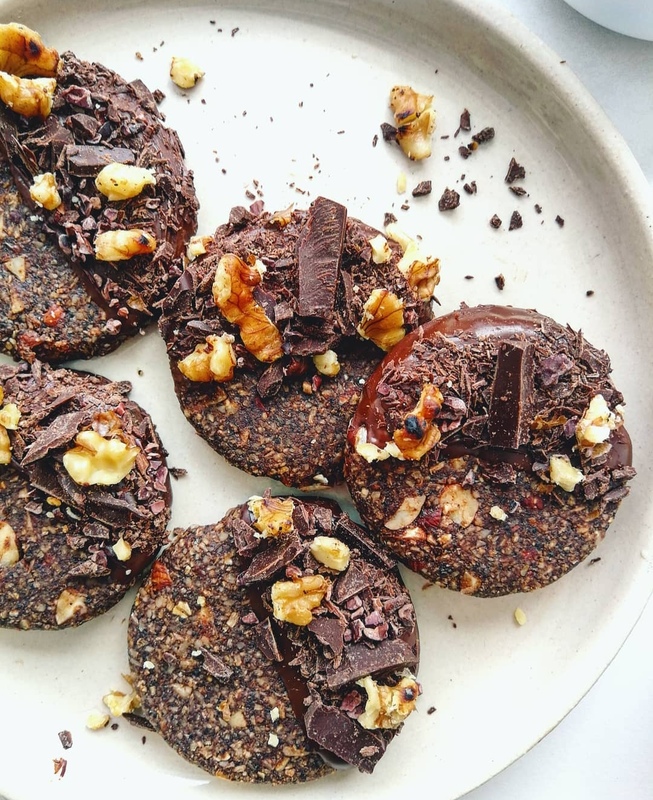 Once the biscuits have become firm dip and drizzle with the melted chocolate and decorate with cacao nibs, chopped chocolate and toasted hazelnuts. Allow the chocolate to cool before serving.